12.10.2011 Fixed a bug in the description for how to address the headings by name in the fields object. 20.06.2011 Fixed a bug with Firefox. The function “init_fields()” in the code for the file “BuildHeadingsFromArray.js” is replaced with “init_field_v2()”. 04.03.2010 Small update to the function “buildHeadingsFromArray(arr)” to skip “wrong FieldInternalNames”. Added padding-Left option. Here is another method that creates the headings without having to add a “placeholder” in the form. The jQuery-library is found here. The pictures and the sourcecode refers to jquery-1.3.2.min. If you download another version, be sure to update the script reference in the sourcecode. The sourcecode for the file “BuildHeadingsFromArray.js” is found below. Read here how to add a CEWP to the NewForm, DispForm or EditForm, and how to find the FieldInternalName of your columns. insertBefore: FieldInternalName of the field to add the heading to. strong>fontColor: Color name or hex value. descriptionText: The description test – leave blank if no description is required. descrFontColor: Color name or hex value. // Does the field exist? // Add heading to fields object – refer as "heading_FieldInternalName"
Save as “BuildHeadingsFromArray.js”, mind the file extension, and upload to the scriptlibrary as shown above. This is a much cleaner way to apply the headings. Is there an easier way to apply the formatting. Instead of specific color and sizes can we have this shared for the array? Or is there a way to apply a class like you did in the earlier version so it pick up the site theme? Never mind. This script is fairly straight forward. I have been able to make some of the changes. I think I can replace the styles with a theme class. Just a quick requeswt. How can I change the array so the repeated options can be shared across multiple fields? Hi, do i need to add anyhting to the BuildHeadingsFromArray.js file to get this to work as the headings just disappear if I modify the CEWP code with the above? I’m trying to use this on a task list were the entry comes from a workflow. I am looking at the Source and it’s a mess and what ever I insert won’t make the headings come up. Don’t know if this is possible or if you know how, I appreciate the help. Is there a way to add background color to just the Heading row? You would have to add this option by editing the script – it is a “normal” style attribute of “background-color” that has to be added. Awesome! This was so easy! Thanks!! Has this been tested in Firefox with success? I am not seeing it work on my end via FF. Thanks. See updated code and the comment in the top of the article. Thanks for the bugfix! You are a smart person. I so far am unable to get this to work in a survey new or edit form. Any advice on how to go about doing so? Note that this works for the headings only as the layout in a survey is different then in a list (a separate TR for the label and body) and this modified function “selects” the TR containing the formlabel to be able to insert the heading before the label. Does this work with a Custom List that uses Content Types? I’ve tried with no luck at all. I don’t seem to be able to get this solution to work in surveys even with your suggestion above. The header appears inbetween the question and the answer? Any Ideas? I have not tested this so maybe you must use “prev().prev()”. 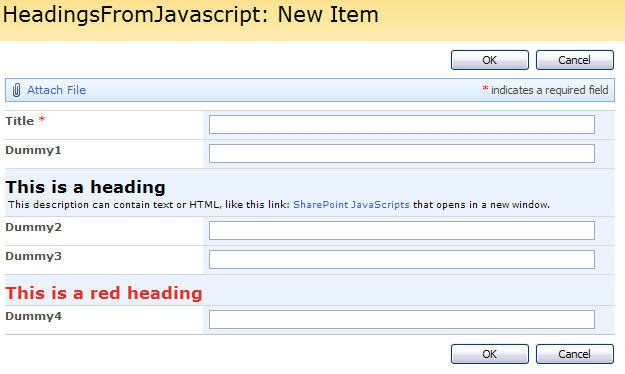 Hi, should this be compatible with your Tabs for SharePoint forms v2.0 solution? For me it adds the header in random places on every tab. The headings created with his solution get a “name” like headingAfter_Title, or headingBefore_Status. These names can be used in the array of fields to include in a tab.